Oracle has announced the Sparc T3 processor and its related Sparc T3 systems at the OpenWorld extravaganza in San Francisco, giving Solaris shops who had run out of headroom on the existing Sparc T2 and T2+ machines a little breathing room – and giving Oracle a chance to chase some entry and midrange Unix server sales against rivals IBM and Hewlett-Packard. 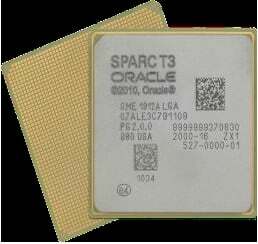 The Sparc T3 chip, developed under the code-name "Rainbow Falls," is first chip that Oracle co-founder and CEO Larry Ellison could claim as his own. And as you can see from the chip packaging below, it does not bear the Sun logo, but the Oracle logo. The Sparc T3 is a 16-core kicker to the current eight-core Sparc T2+. The initial versions of the Sparc T3 chip come with either 8 or 16 cores activated and run at one clock speed, 1.65 GHz, according to the spec sheet. It is possible that Oracle is selling geared-down chips running at 1.2 GHz or 1.4 GHz, as Sun did with the prior generations of Sparc T series chips. The Sparc T3 chips use a 40 nanometer process and are fabbed by Sun's designated wafer baker for the T3 chips, Taiwan Semiconductor Manufacturing Corp. The chip has a die size of 371mm and like its predecessor offers glueless scalability (meaning it does not require an additional chipset to do symmetric multiprocessing) from one to either two or four sockets. The Sparc T3 chip has eight threads per core and one nine-stage floating point unit per core. The Sparc T3 core has 8 KB of L1 data cache and 16 KB of L1 instruction cache and 6 MB of L2 cache shared by the cores, carved into 16 banks of 384 KB each. The on-chip memory controller supports DDR3 main memory, and Oracle is currently supporting 1.07 GHz sticks in the Sparc T3 systems. The Sparc T3 chip has two 10 Gigabit Ethernet network interfaces and two PCI-Express 2.0 x8 interfaces etched onto it. it also sports a cryptographic co-processor on each core than can do an alphabet soup of encryption and decryption. It is truly a system on a chip. Depending on the workload and how many cores and threads are activated, the Sparc T3 chip dissipates between 75 and 139 watts. This is roughly the same range as AMD's twelve-core Opteron 6100 processors. Oracle is launching four different Rainbow Falls servers: three rack servers and one blade server. The naming conventions for the box are absolutely simple and useful. The machines are called Sparc T3s, just like the processors, and have an additional numerical designation to tell you how many sockets are in each box. If the machine using the Sparc T3 chip is in a blade, tack a B onto it. 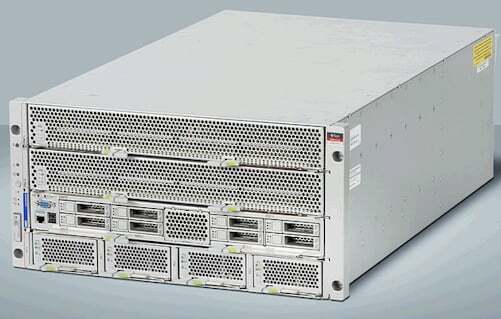 Thus, the Sparc T3-1 server is a 2U rack-based server with a single socket. (The spec sheet says the T3 chips are running at 1.6 GHz, which could be a slight shaving off the clock speed or a typo). With that one processor, Oracle can cram 128 threads into a single machine. The Sparc T3-1 has sixteen memory slots, and Oracle is currently supporting 2 GB, 4 GB, and 8 GB sticks for a maximum of 128 GB. (The minimum server configuration is four 2 GB sticks). The server comes with four Gigabit Ethernet ports on the system board, and with an optional mezzanine card, you can plug into the 10 Gigabit Ethernet ports on the Sparc T3 chip itself. The server has four x8 PCI-Express slots plus the two x8 and two 10 GE links on the chip. Depending on what backplane you select, you can have eight or sixteen 300 GB. 2.5-inch SAS disk drives (spinning at 10K RPM) and a DVD drive. That's it for disks. Sun's Flash Accelerator F20 PCI-based flash memory cards are also supported in the system. The Sparc T3-1 server has two hot-swappable 1,200 watt power supplies. The Sparc T3-2 server doubles up on the entry Rainbow Falls box, plunking two T3 processors in a 3U rack-based box and doubling up main memory to 32 slots and a maximum of 256 GB. (Again, the spec sheet says 1.6 GHz chips are used, but the processor spec sheet says the chip runs at 1.65 GHz). Some disk space gets sacrificed to make the Sparc T2-2 machine, which only has room for six 300 GB small form factor disks and a DVD drive along the right six of the chassis. The front of the chassis is dominated by three fans, which keep all that memory and those two processors cool. The Rainbow Falls T3-2 server only supports 4 GB and 8 GB DDR3 memory sticks, by the way, and it will probably get support for 16 GB sticks before too long. The server has four integrated Gigabit Ethernet links on the mobo, and you can snap in a mezzanine card to link into the four native 10 Gigabit Ethernet ports on those two T3 chips. The system has ten PCI-Express 2.0 slots (eight x8 and two x4). The box comes with redundant 2,000-watt power supplies and also includes a RAID 0/1 disk controller. The Sparc T3-4 is the drafthorse in the new server lineup, with two or four T3 processors (running at 1.65 GHz). John Fowler, executive vice president in charge of Oracle's Systems and Storage group, said the machine supports up to 1 TB of main memory in his keynote at OpenWorld, but the spec sheet says that it currently tops out at 512 GB with 8 GB memory sticks. From the outside, it is obvious that the Sparc T3-4 design stacks two two-socket T3 motherboards on top of each other and uses the glueless electronics of the chips to create a four-socket box. The T3-4 server has four hot-swappable power supplies rated at 2,060 (with 3+1 redundancy) that mount in the bottom of the rack unit, followed by eight 2.5-inch disk drives on top of these, and the two system boards on top of those. The box has eight x8 PCI-Express 2.0 slots plus the two optional 10 Gigabit Ethernet ports. Like other former Sun Sparc boxes and the new Oracle ones, this Sparc T3-4 machine has four Gigabit Ethernet ports on the base system. The whole shebang takes up 5U of space on the server rack. This machine packs 512 threads and will be a contender in the high-end of the midrange for a lot of workloads. Particularly thread-hungry Oracle databases and Java applications. The LDom hypervisor tops out at 128 domains on this server, by the way. It is tipped on its side for the sake of photography, so it might look a bit like a rack-mounted server, but the Sparc T3-1B is not. It slides into Oracle's existing Sun Blade 6000 chassis. The T3-1B blade has a single T3 processor socket with its chips running at 1.65 GHz and sporting 128 threads. The blade has the same 16 memory slots and the same 256 GB maximum memory configuration as the Sparc T3-1 rack server. (They are very likely based on a very similar if not the same exact system board). The T3-1B blade has only two Gigabit Ethernet ports, plus a dedicated 100 Mbit Ethernet port for blade management and the two optional 10 Gigabit Ethernet ports that are driven from the chip. The blade has four 2.5-inch SAS drives and has four PCI-Express x8 slots that reach out to expansion modules at the back of the Sun Blade 6000 chassis. Oracle Solaris 10 update 9/10 is required on these Rainbow Falls boxes, which also support the latest Oracle VM Server for Sparc 2.0 update (what used to be called Logical Domains or LDoms by Sun). Licenses for both products are bundled on the machines at no cost. The LDom support allows for each thread to be configured with its own Solaris 10 instance, or for many or all threads to span an instance.